A tricycle is a three-wheeled version of the bicycle and is typically marketed towards young children as they learn to ride on pedaled vehicles. You don't have to be an experienced artist to properly execute a drawing of a tricycle, but patience and dedication are two useful attributes. 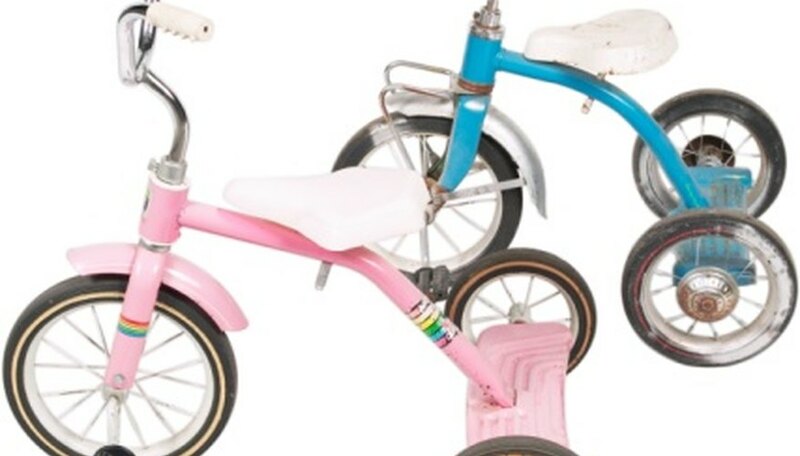 Additionally, select a picture of a tricycle to help you understand how each part connects to this children's toy. Draw a large circle somewhere on the left-hand side of your piece of paper. Draw a much smaller circle on the right-hand side, ensuring that the bottoms of these circles are perfectly even. You may want to turn your piece of paper sideways for a landscape vantage point for this particular exercise. Sketch a rectangular guideline that connects both wheels to each other. The height of this rectangle should rest at the height of the tricycle's handlebars. Use light pencil strokes to create this basic guideline, as it will be erased once you have the framework laid out on the paper. Sketch two straight lines upward from the center of the larger circle to represent the fork and stem of this front wheel. These straight lines should be slightly slanted to about 15 or 20 degrees, but not much more. Connect the two lines at the bottom with an alternative straight line. Create the pedal of the tricycle that is visible to the viewer with a small rectangle drawn in the center of the front wheel. This rectangle will overlap the previously drawn bottom of the fork. Draw the handlebars on top of the fork and stem you have just created. Sketch a small tubular end to the the side of the handlebar closest to the viewer of this picture. Create a rigid surface underneath this tubular end to act as the finger grip. Sketch out two curved lines from just below the handlebars, or stem, all the way down to the center of the small wheel. This piece connects to a flat base, or axle, that connects both of the rear wheels. Because the drawing of your tricycle is from the side viewpoint, you will not be able to see the base or the secondary rear wheel. Create the tires of both the front and rear wheels by sketching a circle slightly smaller than the respective wheel. Sketch straight, interlacing lines inside each of the wheels to detail the spokes of this vehicle, just as they are pictured in the reference guide. Draw a slender oval in the middle section of the curved tube that connects the fork of the tricycle with the base of the rear wheels. This oval will represent the seat where the child sits. Curve the top of the seat accordingly. Outline all of the intended pencil marks that define the tricycle with an ink pen. Do not trace over the rectangle or any other lines you used as guidelines. Let the ink dry, then completely erase all remaining visible marks from the page. Matt Wooddy has been a freelance writer since 2006. His work has been featured in local and national audio magazines. Aside from graphic design and illustration work, he has also taught several classes on painting and drawing basics. Wooddy is also a DJ and technical engineer.